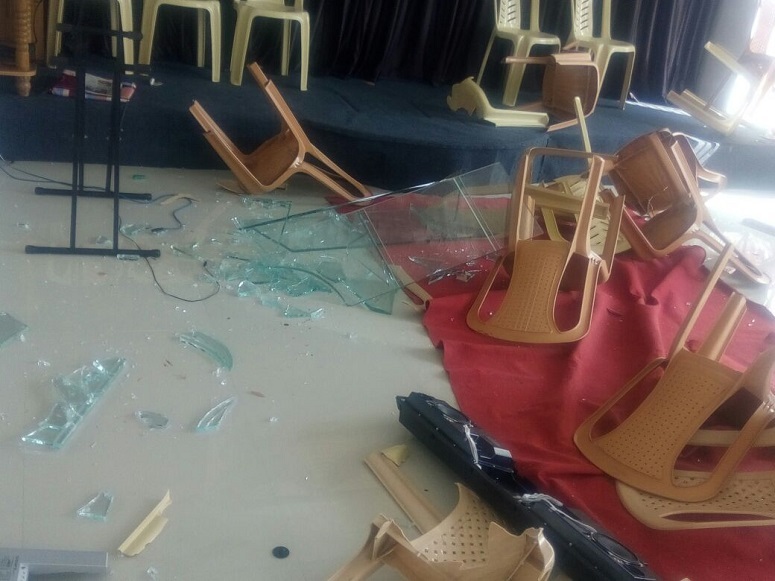 Damage to Christian meeting hall in Tamil Nadu following mob attack on 9 December (World Watch Monitor). After a year in which hate crimes against Indian Christians happened at a rate of almost one verified incident per day, the state which registered the most incidents in 2017 (over 50) – Tamil Nadu – continues to see outbreaks of violence. In the first two months of 2018, the United Christian Forum has already counted nine incidents in the southern state, including the mysterious death of Pastor in Kanchipuram District. Two weeks after that incident, on 4 February, a “house church” in the town of Suleeswaranpatti, in Pollachi Coimbatore District, where Christians had been gathering for 20 years, was attacked by Hindu Munnani activists. Hindu Munnani is a religious and cultural organisation based in the state, formed to defend Hinduism and protect its religious monuments. A group of ten extremists forced their way into a hall where Christians were holding a Sunday service. “They shouted slogans demanding us to stop running the church,” Pastor Challamuthu Stephen told World Watch Monitor. About four years ago, Stephen was brutally attacked by activists, including, he claims, one of those who was also part of the most recent attack – a man identified only as Armugam, but who has yet to be charged for either incident. Immediately after the most recent attack, Stephen, with others from the church, went to the police station to file a case. But the police refused to file an official report – known in the Indian subcontinent as a First Information Report. After Christians pestered the police, they eventually filed a case against four men – Puffs Shiva, Gopala Krishnan, Sabareeswaran and Karunakaran – but only on minor charges under Section 448 of India’s Penal Code, relating to “trespassing”, “reciting obscene songs in public places”, or “mischief causing damage”, with the potential punishment being a fine equivalent to less than one US dollar. “The case doesn’t stand as serious in connection with the incident,” Stephen told World Watch Monitor. Following another attack by Hindu extremists on Christians, before Christmas, Tamil Nadu police closed another private property used for study of the Bible and Christian worship. Again, a mob of about 20 Hindu Munnani activists barged into the church premises, where a pre-Christmas charity event was being organised, on 9 December. 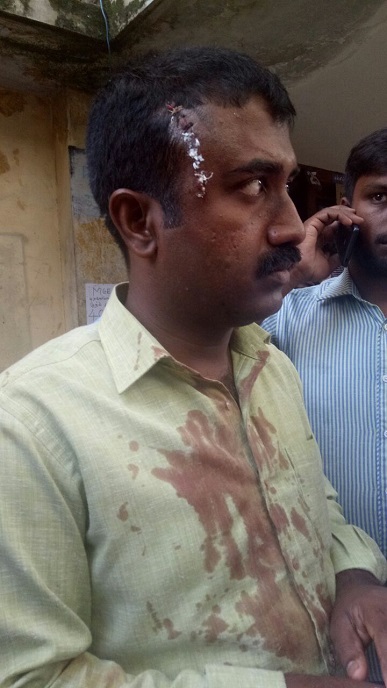 “The assailants came with steel rods and stones, and started beating us,” Pastor Karthik Chandran told local media. “Pastor Karthik, two other men and a 55-year-old female church member were injured,” Pastor Vinodh Kumar told World Watch Monitor, adding: “The police detained me instead of arresting the attackers. I was released at around 1.30am. The five men told the Christians that a Deputy Superintendent of Police, M. Gunasekaran, had appointed them to keep watch on the property, and “to not allow the Christians [access]”. The Christians have still not received any official permission from the concerned district authorities to conduct worship services, Gunasekaran said. In 2017, in October alone, as many as 30 Christian prayer halls received “show-cause notices” –notices demanding that the Christians provide a reason why action should not be taken against them – from District authorities. But in response to writ petitions filed by three churches from the Sulur area in Coimbatore, the high court of Madras stayed the notices issued by the jurisdictional revenue officials. According to the Tamil Nadu Panchayat and Buildings Act, a private gathering for worship is not subject to registration, and hence the churches need not appeal to the District authorities for permission to assemble and pray. However, just two days ago, on 28 February, another 11 churches were ordered to close in Nilgiris District, without being issued any legal notice. This morning, 2 March, they were told they could reopen, but their case is yet another example of the challenges Christians face in Tamil Nadu.